Wow ... what an eagerly anticipated film! 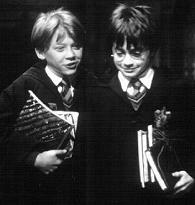 More than a week before its release, "Potter" magically appears in entertainment spots across the networks. There's even a countdown to Harry. And then, at my particular screening, five days prior to release, without an empty chair in the house ... applause BEFORE the film. With such hoopla, one can easily become "over-excited." Though many applauded after the film as well, I remained only modestly impressed. You should also know that I have not read that thick book. As an infant wizard, Harry is left on the doorstep of a ridiculously rude mortal family so that he can grow "quietly" into his adolescence. Fortunately, his guardian angel (an adorable hairy giant) returns to whisk Harry (on his 11th birthday) off to wizard academy. The giant and later a sneeringly disturbing academy professor (played by Robbie Coltrane and Alan Rickman, respectively) bring to the film a rich mature brand of acting amidst a cavern of otherwise decent performances. Because he begins the film as an infant, you might expect to follow him into adulthood - don't. This wizard academy plays host to all the mysterious and fun escapades remaining in the film: from "potions class" with black-pot brews set neatly atop rows of Bunsen burners to "broom-flight class" where things get a bit out of control with these underage-flyers. Orientation days of making new friends at a new school dominate the first half of the picture. After that, Harry stumbles across a larger mission menacing in the dungeons of the academy itself. Set in England, this maze-like adventure, echoing of "Dungeons and Dragons," meanders at a wanderer's pace. I became intermittently antsy with the lack of emotional drama during the two hours prior to a somewhat oddly curt conclusion. Though intended to be "hyper-real," the film still tried my patience during a few ridiculous circumstances, for which I'll bet pre-pubescent viewer imagination would be more than happy to fill in these holes of rationality with goblins, spells, and mystery. Btw, very convincing in a small part, kudos to Matthew Lewis as nervous Neville. 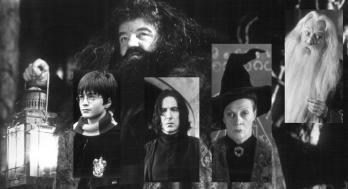 Harry Potter and the Sorcerer's Stone. Copyright © 2001. Rated PG. Produced by David Heyman at Warner Bros/HeyDay films/1492/Duncan henderson.